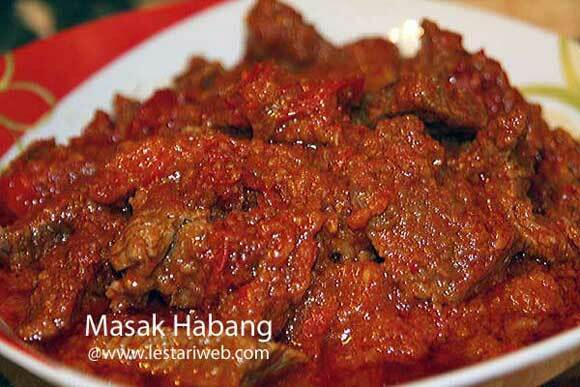 Masak Habang (Cooking in Red Sauce) is a typical dish from Banjarmasin, South Kalimantan. Habang means red! So it's name already suggest it's character which's dominated by the red colour, provided by the chillies in it. This time I choose beef as the main item to be cooked as example. Anyway before I forget, for you who do not like spicy food, don't feel intimidated by the RED colour :-) Although this dish looks like a fire, the spiceness level is quite low ;-) because we used de-seeded large red chilli instead of the fire-spicy bird's eye chilli! (If necessery add a little bit oil to help the blending process). Stir fry the paste all the time until well cooked & fragrant. Pour in the water and continue simmering on a medium heat until well cooked. Stir occationally. Add the tamarind water, palm sugar and salt. Adjust the seasoning to taste. 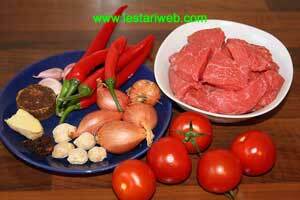 Add the sliced tomatoes and continue cooking until tomatoes has deformed and the sauce becomes thick. Serve hot with rice.